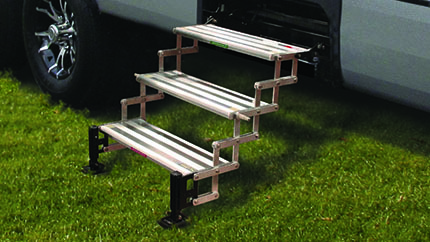 Does your truck have running boards / bed access steps that are under the truck bed? "I have the Talons on my camper, and I really love them. They are very lightweight and very heavy duty. They are made of aluminum which means they are not going to rust, they are not going to corrode, I don’t have to worry about the paint coming off. 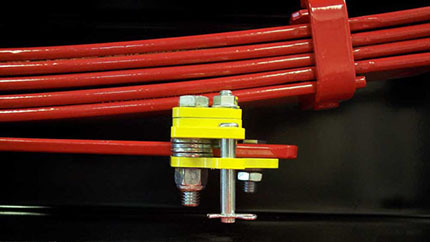 They are just a good overall Tie Down system." "I love the Power Armor. It does everything that I’d expect from a company like Torklift. Quality construction and built to last! It is also a very convenient alternative to a roof top solar panel." "When we ordered our newer, larger, heavier trailer (two-horse straight load with extended tack) I switched out the hitch for the Torklift, with a 36" extension. World of difference. Buy it once, and buy the right product." "Our dogs used to be hesitant to walk up the steps, but with your SafeStep blocking off the opening between steps, both dogs went right up the steps without fear." "The StableLoad has been a great fit for our dealership and our customers over the last year or two. Because it’s an economical option, it’s the first option I turn to when customers come to me with suspension problems when air bags just aren't enough." "We’re proud to use Torklift tie downs exclusively. When you tell customers all the benefits, they choose Torklift every time. Great warranty, great dealer support, great products, easy to install - that means happy customers!" 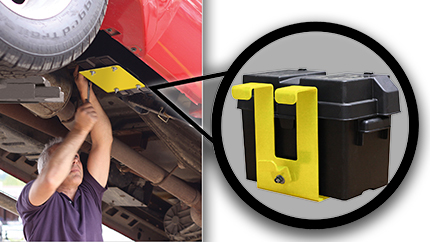 "The Torklift products are extremely well made. We have towed our boat for hundreds of miles through rough terrain in Alaska. The FastGuns make life easier. It's a pleasure to tow with good equipment. Top of the line products worth every penny."